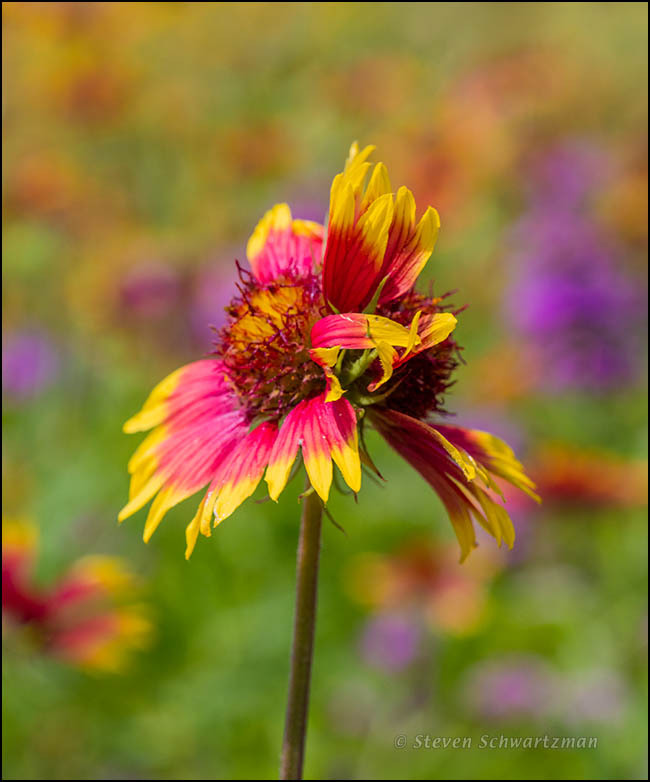 In the Balcones District Park on May 13th I found these two firewheel (Gaillardia pulchella) flower heads conjoined back to back on a single stem. The fact that the stem was somewhat flattened makes me think fasciation* was at work here. The purple in the background came from horsemints (Monarda citriodora). * You can pronounce the sc in fasciation as ss or sh. And because I am currently fascinated by the Royal birthday weekend in London, this fasciation makes me think of fashion and fascinators. Oh my…….I would have been kept very busy. I wanted to see the Hall of Gems but we ran out of time. In the large exhibit devoted to the world of plants, New Zealand was represented by your flax plant. Hey, Siamese twins! Quirky. I discovered the top of a lupine plant in my garden with 2 tips … split personality? Fascinating fasciation. Riotously colorful background. That background gives you a sense of how lush the wildflowers in Austin became after repeated rains. Hi, Lynda (from Chicago). From what I’ve read about fasciation, there can be several causes. I have the impression that the phenomenon isn’t fully understood. Whatever the cause, I always look forward to finding my next instance of the phenomenon. This was my first (and so far only) example for 2016.